Bill and Hillary Clinton may not be joined together at the hip, but they are connected at the base. For if the former First Lady is to win the Democratic presidential nomination next year, it most likely will be by resurrecting a coalition of voters quite similar to the one that propelled her husband to the Democratic nomination in 1992. The irony is that it is not the base of support that one would suspect two of the “best and brightest” of the baby-boom generation to fashion. Rather, the heart of the Clinton’s base is a “downscale” coalition of minorities and the elderly, the less educated and the least affluent, as well as the most partisan Democratic voters. Bill rode this coalition to the Democratic nomination in 1992. Early polling this year shows that Hillary is reassembling it. To be sure, in chasing the Democratic nomination in 1992, Bill showed strength across the demographic spectrum–as has Hillary in polling thus far this year. But the greatest strength of both is their appeal to voters who are living lives much different than the Clintons. That was evident at the very start of Bill Clinton’s presidential run in 1992. His campaign nearly ran aground during the New Hampshire primary campaign, buffeted by allegations of draft evasion during the Vietnam War and strong hints of a lifelong penchant for womanizing. But it was not in the affluent suburbs of the Granite State or its liberal academic communities that he earned his moniker as “the Comeback Kid.” It was in the blue-collar mill towns of New Hampshire–places such as Berlin, Claremont and Rochester–where he won the votes necessary to score a solid second-place finish and earn the right to fight (and win) another day. Hillary, thus far, has yet to be tested in any Democratic primary. Both of her successful New York Senate runs were launched with virtually free passes to nomination. Last year, though, she was challenged by a little-known anti-Iraq War candidate who made conspicuous inroads in the liberal academic-oriented counties that include the college towns of Ithaca and New Paltz. In each of these counties, she lost more than one-third of the vote to a challenger who was essentially a human “none of the above” line. It is of little matter if Hillary runs poorly in academic communities in next year’s Democratic primaries. Many of the party’s presidential standard-bearers have won the nomination without much support from academia. In fact, they have used the opposition of liberal intellectuals to underscore their credentials as mainstream candidates. A far bigger threat to Hillary in the months ahead is a hemorrhaging of her base, a possibility that underscores a major difference in her bid for the 2008 Democratic nomination from that of her husband’s in 1992. He launched his campaign as a little-known dark horse in a field of political lightweights, so light in fact that it was dubbed “the Seven Dwarfs.” She is in the opposite position–as the early front-runner in a field that is viewed as much more formidable. Sources: For 1992 data, New York Times, July 12, 1992, an aggregate of exit polls from 29 Democratic primary states. For 2007 data, Gallup Poll release, May 24, 2007, an aggregate of six Gallup Polls on the Democratic presidential race from March to May 2007. Note: An asterisk (*) indicates that the Gallup Poll entries in the age, family income and partisan affiliation categories are different than those cited in the 1992 exit polls. The age breakdowns for this year’s Democratic race are 18-29, 30-49, 50-64, and 65 and up; the family income categories are under $30,000, $30,000-$74,999, and $75,000 or more; and the partisan affiliation entries are Democratic and Lean Democratic. Bill Clinton did not have to worry much in 1992 about the cerebral Paul Tsongas or the mercurial Jerry Brown matching his appeal to minorities and the poor. Already though, Hillary faces a fight for the African-American vote from Barack Obama. And she could lose a significant share of the Hispanic vote to Bill Richardson, as well as confront stiff competition for the blue-collar vote from John Edwards and other labor-oriented Democrats. Yet Hillary could have an ace in the hole in her entree to the women’s vote. As the first major female presidential candidate, the historic nature of her candidacy is self-evident. And she has underscored the importance of her own gender by making this vote-rich demographic a central emphasis of her campaign. That is smart politics. According to exit polls in 1992, women cast 53 percent of all the Democratic primary ballots, and their proportion of the vote in next year’s primaries could be just as large. 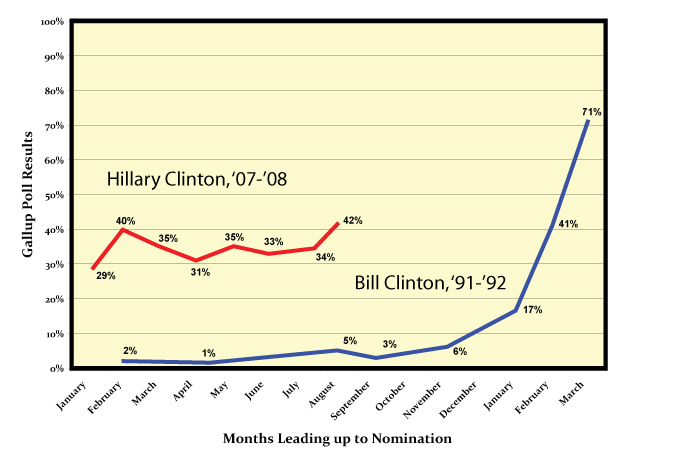 Bill ran only slightly better among women than men in his pursuit of the 1992 nomination. Not so with Hillary this time. She runs markedly better among women,to the tune of 10 percentage points better in some recent polls. If she could dominate such a large voting bloc in next year’s primaries, it could offset losses that she might suffer in other parts of the electorate. Yet there are also some noticeable fissures already evident even within the women’s vote. Hillary runs strongest among those who see her as a role model–young, single, working-class women; weakest among those who would regard here as a peer–older, married, professional women. Hillary Clinton launched her presidential campaign this year in an opposite position from her husband 16 years ago. While the former First Lady has been the early front-runner this year in a Democratic field that looks formidable, Bill was a little known dark horse in a comparatively weak field of Democrats when he began his quest for the presidency. He did not reach double-digits percentagewise in the Gallup Poll until early in 1992, and did not become the favorite of his party’s voters until the eve of the New Hampshire primary in February. Source: Gallup Poll. In months where more than one poll was taken, the results of the last poll are used. Because the 1992 Democratic presidential campaign began much later than this one, polls on the nominating contest were taken on an irregular basis throughout 1991.